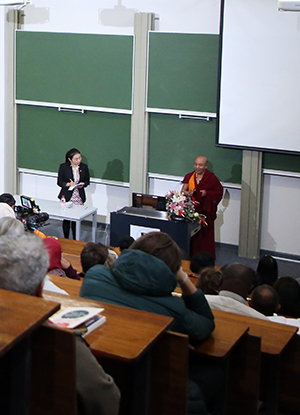 Tibetan Buddhism, with a history of around 1600 years, is increasingly appealing to the young intellectuals and scholars today. 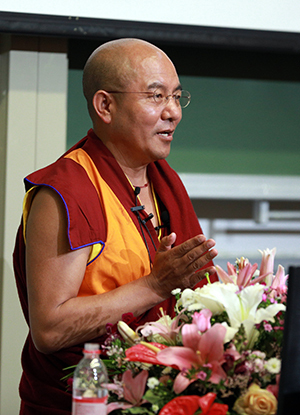 To make it better understood, Khenpo Sodargye introduces the distinctiveness of Tibetan Buddhism from perspectives of precepts, hearing of the teachings, debating and practice; he also sheds light on some daily practices including prostration, malas, and carving Mani stones. Yet among all the rituals and practices, bodhicitta and emptiness is the quintessence of the teachings of Tibetan Buddhism. Tibetan Buddhism lays much emphasis on lineage transmission that has been passed on till today from the Buddha to our teachers. It carries great power, continuously and without interruption. Without receiving such transmission, one is not allowed to teach others however wise and skilled he might be. And this is something less, or at least not equally, cherished in other sects. To summarize the entire teaching of the Buddha, it is: To refrain from doing any evil, to cultivate all good, and to purify one’s mind—this is the teaching of the buddhas. That is to say, all the conduct that is detrimental to the human society shall be avoided; all that is beneficial to the human society shall be adopted; on top of that, we shall tame our mind to gain the inner peace. There are different kinds of rituals, activities and Dharma assemblies in Tibetan Buddhism, yet with the absence of an altruistic mind—the mind of wishing to bring happiness to all sentient beings, none of these can be considered as the real Buddhism or as Mahayana Buddhism. The “wisdom gained through contemplating” entails the process of strengthening the knowledge acquired in front of our teacher through reflection and pondering. In this process, we can express all our doubts to the teacher and other students and try to dispel them by way of discussing, debating and independent retrospection. Whatever doubt we have including the doubt for Buddhism or for other religions can be debated on site. Therefore, in Tibetan Buddhism, it is very much welcomed to eliminate all the doubts openly through debate. I was often asked why Tibetan Buddhism is increasingly appealing to the young intellectuals today? The answer that I usually gave to people was: The first reason is that Tibetan Buddhism has done a detailed examination of the nature of emptiness. And the second thing special is its emphasis on bodhicitta, which can be better understood by learning The Way of the Bodhisattva. Therefore, that Tibetan Buddhism bases its view on emptiness and on acts in accordance with bodhicitta might be the aspects that draw their attention as I concluded.